[HollywoodInvestigator.com] It's a well known Catch-22. In Hollywood, no producer or studio will read a screenplay unless an agent submits it. But it's hard to find an agent unless producers and studios are already interested in you. Now Hollywood's high-powered Paradigm Agency has upped the ante. Paradigm refuses to read a screenplay unless it's submitted by an agent! You read that right. You need an agent to get an agent! "We are returning herewith the materials which you have submitted to us. Unfortunately, due to a high number of unfounded copyright and idea submission claims in the entertainment industry, our company policy prohibits reading, evaluating, considering or accepting unsolicited materials. All material must be submitted through an established entertainment representative. 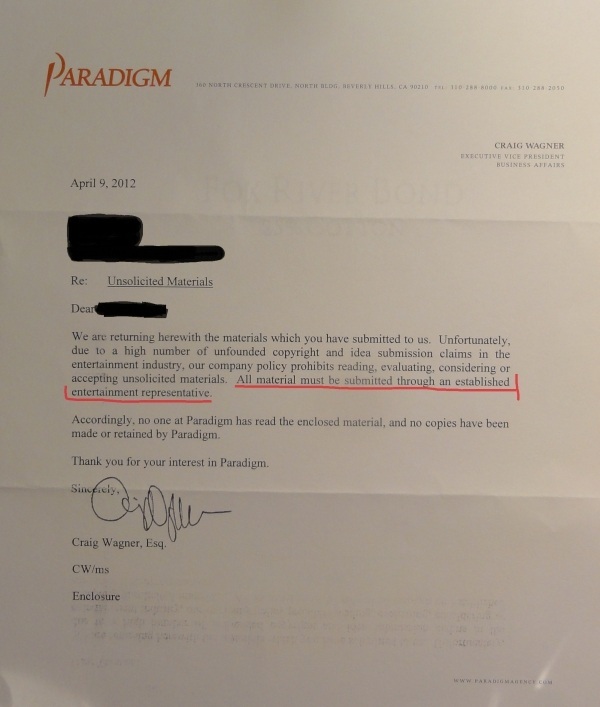 "Accordingly, no one at Paradigm has read the enclosed material, and no copies have been made or retained by Paradigm." Okay, I can understand a producer or studio requiring that all material be submitted by an agent. But for an agency to require that it be submitted through an agent?! Hey, bub! If these guys had agents, they wouldn't be looking for an agent, now would they? This is not Catch-22. It's beyond Catch-22. It's Catch-22 Squared. Agents are supposed to be the gatekeepers of the industry. They're supposed to read query letters, to seek out new talent, to vet new screenplays for producers and studios. Agents are supposed to assume the legal risk of reading new material -- which is not really a risk, since after reading the query letter, they can always send a release form to the the writer before agreeing to read the actual screenplay. But if Paradigm won't even read a query letter unless it's been submitted by another agent -- well, what's a new writer supposed to do? 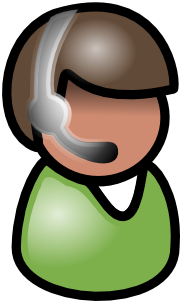 Find an agent that specializes in find you another agent? Actually, Paradigm is not the first agency to return query letters unread. As far back as the 1990s, the superhouse Creative Artists Agency (CAA) would routinely return query letters unread, with the usual "No one at CAA read your letter, etc." In their extreme paranoia, CAA would even return the writers' self-addressed, stamped envelops -- unused -- in their own CAA envelops. Maybe to prove that, since no one at CAA had looked at the SASE, no one even knew that it was an SASE. What, they got blind monkeys returning all queries? So if agents no longer read query letters, who are the new gatekeepers into Hollywood -- assuming gates even exist for newcomers? Or is Hollywood off-limits to anyone except those born into the industry? Back in the 1990s, it was said that you needed a manager to get an agent. The manager would find an agent for you. But the top managers are all also producers (usually of their clients' work), and like any producer, are even tougher to obtain than is a top agent. Some say that film festivals are the new way to break into the industry. First you must make your movie, then -- if it's a success -- agents and managers will approach you. 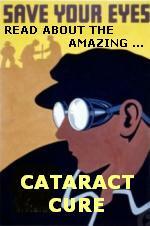 But others say that film festivals are but the latest scam, the newest way to fleece wannabes. Then there are those who say that film schools are the way to make it in the movie business. That you can't break into established Hollywood, but that you can form vital new contacts at film school (i.e., hope that some are your fellow students are the sons and daughters of established Hollywood players). Then again, there are those who've gone the film school route and believe that it too is a scam. Others say that Hollywood is a closed system -- in violation of anti-discrimination laws. That the only way to make it in the business is to choose your parents wisely. Mimi Brickmeyer is a Los Angeles based entertainment reporter who has extensively investigated Hollywood's biggest celebrities. 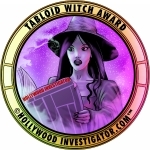 Read about her adventures in tabloid journalism in Hollywood Witches.